When the murder weapon is revealed as one of the wooden stakes used to identify trees on the farm, Sheriff Evan Grey turns to Holly's father, Bud, and the Reindeer Games staff. And it doesn't help that Bud and the reindeer keeper were each seen arguing with Margaret just before her death. But Holly knows her father and is determined to exonerate him. The jingle bells are ringing, the clock is ticking, and if Holly doesn't watch out, she'll end up on Santa's naughty list. ©2017 Jacqueline Frost (P)2017 Blackstone Audio, Inc. I was drawn into this book from the beginning. The characters are fully fleshed out with realistic behavior and intentions. The plot is well developed and the villian isn't revealed until the end. I enjoyed the relationships of Holly and her parents, and the budding relationship between Holly and Evan Gray. This is a really entertaining book. I look forward to the next book. Christmas Cozy - just right! This book is the definition of a cozy mystery. Wintery fun holiday imagery is woven throughout an ungory mystery. A pleasant, mild romance adds a nice touch without distracting from the mystery. 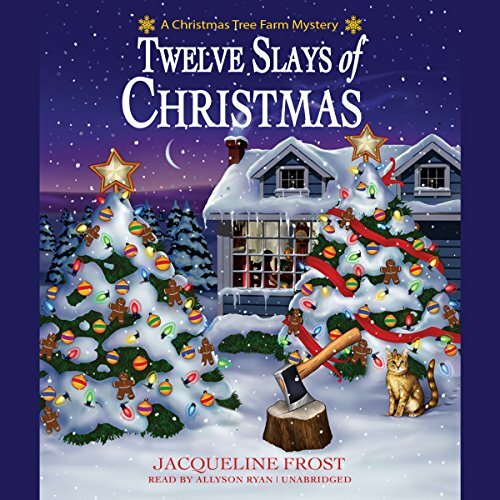 When Holly White gets dumped two weeks before her wedding, in Twelve Slays of Christmas by Jacqueline Frost, she returns from her relocated home in Portland to her hometown of Mistletoe, Maine. There her parents run a Christmas tree lot started by Holly's great- great- grandparents, but they have added a nice diner and hold a 100- year- old Christmas program called 12 Days of Reindeer Games at their location. Each day in the run-up to Christmas, the family holds a special event. The evening before the festivities are due to begin, Margaret Fenwick, president of the Mistletoe Historic Society, creates fights with many local residents over her complaints that their properties do not comply with historical standards, upsetting many people in the community. Then, later that night Holly goes outside, where she finds Margaret's body in the border of her family's property. The woman has been bludgeoned by a stake used to label the different types of Christmas trees. Sheriff Evan Grey, newly relocated to Mistletoe from Boston, where he worked the homicide squad at the loss of his personal life, arrives on the scene. Holly decides to do her own investigation but keeps running into Sheriff Grey, who makes his disapproval of her actions very clear. In addition, Holly gets warning signs from the murderer, causing the sheriff to warn her off even further. Then in town, Holly runs into a reporter who took the yearbook class with Holly while she was a senior in high school and the reporter, Ray Griggs, a freshman. He seems to know everything about Holly, but she doesn't have any recollections of Ray. He seems romantically interested in Holly, but are his motives clear? To me, cozy mysteries work best when they combine clever mysteries with creative characters. This book fits that description well. I chose to listen to this book because it was the month's choice of a Facebook book club I joined last month, and I'm glad I did. The mystery kept me fascinated and enjoying the plot, as well as the fun activities during the 12 Days of Reindeer Games. It made me start to wonder how we could create our own version of Reindeer Games here in my suburb of Los Angeles. The solution created just enough intrigue to make the answer not very obvious without being impossible to follow. And the conclusion wrapped up with just enough excitement to keep us on the edge of our seats without dragging out the suspense uncomfortably. I also really enjoyed the characters in this book. We enjoy seeing the way that Holly gets reintegrated into Mistletoe society. I find it of interest that both Sheriff Grey and Holly discover that both love The Count of Monte Cristo, each reading the book once a year on average. I personally dislike this tedious book that goes on forever in each stage of the main character's life, so it did intrigue me that both characters like this book. Frost works against some traditional stereotypes by making Caroline, the high school valedictorian who holds an MBA (Master of Business Administration) working to open up a cupcake shop. An MBA requires much more work than a typical M.A. Further, I was surprised to learn that the sheriff holds an MFA (Master of Fine Arts), which is considered the equivalent of a Ph.D. in the arts. Who would imagine that an artist would become a sheriff? Holly herself went off to college to study art, though that didn't work when she discovered she was not artistic, leaving her to work in an art gallery instead. However, she has found her own artistic outlet in making jewelry. I enjoyed the audiobook narration of Allyson Ryan, who performs the book ably and enjoyably. She helps to keep the book moving dramatically without overly intensifying it. I did find it curious that Ryan tries to use a Boston accent for Sheriff Grey, though I didn't think it was entirely consistent, but she didn't try to use a Maine accent for any of the other characters. I really enjoyed listening to Twelve Slays of Christmas. The book kept me attached to it and gave me a very pleasurable listening experience. I highly recommend the book and give it five stars! This was a delightful read, I wish she had more books on audible as I am now hooked on the author. This story captured my interest from the get go, and I was excited to get into my car again and again to continue listening. And I strongly dislike winter driving, but this story made the travels worth the while. I look forward to more by this author. This is a really well done cozy mystery. But even more so, the writing is fantastic. Some cozies can be slow and predictable, this one kept a good pace. The reader had time to experience living in Mistletoe but there wasn't so much dialogue as to slow down the story. I can honestly say that I really liked all of the characters in the story. The narrator was also quite perfect. How everything came together at the end made sense and the writing kept me guessing throughout. I just finished this audio and wanted to find the next book in the series. I do so hope that the author writes another book with the same characters and the same narrator is used on the next one. The town of Mistletoe with all of its sweet and quirky citizens is a place I'd like to visit again very soon! Happy to have discovered this just in time for the holidays. Looking forward to more from this author.